THE LOW DOWN ON SUBPOENAS FOR A SELF REPRESENTED PARTY IN CT! If you represent yourself in family court, you will have a difficult challenge ahead of you as I've explained in previous posts. 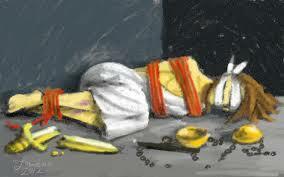 "A self-represented person must abide by the same rules of procedure and the rules of evidence as lawyers. It is the responsibility of self represented parties to determine what needs to be done and to take the necessary action." While this seems reasonable on face value, if you dig down deeper, keeping things equal between self represented parties and attorneys is literally impossible. One reason for this is that the Rules of Procedure in "The CT Practice Book", and the Rules of Evidence are encylopedic and there is no way an average person would be able to wade through them and figure them out on time for a hearing or anything of that kind. Second, self represented parties do not have the same power and authority that attorneys do when it comes to obtaining documents and ensuring that their witnesses are available for Court hearings and/or trials. While attorneys have the power to issue subpoenas at will, self represented parties cannot do so. In other words, self represented parties do not have subpoena power. Unlike attorneys, if they wish to issue a subpoena, self represented parties must ask a judge for permission, and God help them if the judge doesn't want to give them permission. According to Findlaw, a subpoena is "a request for the production of documents, or a request to appear in court or other legal proceeding." There are two kinds of subpoenas. 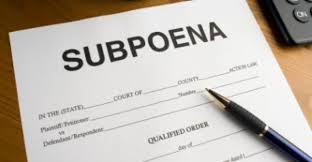 One is a subpoena duces tecum (pronounced "doo-seez tee-kum"), which requires you to produce documents, materials, or other tangible evidence. The second is a subpoena ad testificandum (pronounced "ad test- te-fi-kan-dum"), requires you to testify before a court, or other legal authority. Why is this important? Because proceedings in family court are testimony driven and evidence driven (through documents, tape recordings, video, etc.). If you want to prove the correctness of your legal position in family court, you will need both. Without them, you will lose your case. Period. This is why the power of subpoena is so vital and why not having that power in a family court proceeding is so damaging to self represented parties and why it puts such parties in a position of considerable weakness in contrast to attorneys. So how does the Family Court system handle subpoenas with self represented parties? This seems logical, doesn't it! Ok, but this is the problem. Most judges will simply refuse to approve your request for a subpoena. They just won't. You'd think you would have the procedural due process right to command the presence of your witnesses and obtain necessary documents to prove your position in Court, but you don't--at least not according to CT Family Court judges. 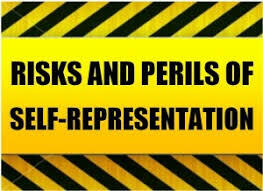 Lawyers do, not self-represented parties. In my experience, when it came to obtaining documents from banks and corporations, my Judge declined to sign subpoenas on my behalf but instead ordered my ex to sign authorizations to obtain access to the documents. So how did my ex sign those authorizations? Slowly. Further, as all judges and attorneys know, authorizations do not have the force of law. This means the banks and corporations essentially refused to cooperate, or later cooperated with great reluctance so getting the documents ended up being like pulling teeth, and I still didn't get the entire set. Plus, I had to pay for the entire expense, not only for the copies of documents for me, but an additional set of copies for my ex. Go figure. So this is the paradox. They tell you that you must act in Court exactly like an attorney, but then they don't give you the same power and authority of an attorney to pursue your case. Not fair? Well, too bad for you. Is there any recourse if a judge refuses to grant your application for a subpoena? If the subpoena is for an expert witness, then you would include the following information: 1) The date when you submitted the required "Notice of Expert Witness" to the Court; 2) Confirmation that you sent the expert witness' report to the opposing party as required by Court Rules and that you have included the witness' name in your trial compliance in advance of trial. If you have a fact witness, then you would simply indicate that you have included the witness' name in your trial compliance in advance of trial. In regard to documents that you wish to subpoena, include in your affidavit exactly why those documents are important and indicate that you have listed the documents you anticipate receiving via the subpoena in your trial compliance. So even though you don't have them yet, you list them and put the word (anticipated) in brackets to indicate you expect them to be produced per your due process right. If you don't know quite what they are exactly, you come up with a reasonably fitting description. This way your request is on the record in another location. If it turns out that, despite the fact that you carefully filled out the forms appropriately and you submitted a well written affidavit, the judge still denies your request for a subpoena, as often occurs, you still have the option of requesting a hearing to have your application reconsidered. See below the form you would need to fill out for such a hearing. Of course, this is ridiculous. Can you imagine how much time it takes to fill out the forms, be denied, submit an affidavit, resubmit request, be denied, request a hearing, wait for hearing, be denied, etc. etc. etc. This can continue for weeks, meanwhile the day of trial is looming on the horizon and you have no idea whether you can actually present your case in a competent manner because you are being denied access to witnesses and documentation necessary to do so! But that's all in a day's work when it comes to how the CT Family Court screws self-represented parties. I am aware that, since my day, the website for the CT Judicial Branch has been crammed with all sorts of information and advice for self represented parties. If you didn't know how the system works and you just looked at the website, you'd think life was delightful for self represented parties. Bottom line, however, is that no matter how they have prettied up the website in a PR campaign, the practice of the law in family court has remained unchanged and self represented parties are just as disadvantaged as ever before. I hope everyone gets that from this discussion. Where do you stand if you are able to jump all these hoops? For one thing, you are completely stressed out because in the weeks prior to trial you just didn't know if you'd have the witnesses or documents you needed to present your case. You've probably done double or triple the work preparing to argue a case despite not having what you needed. Then you ended up getting discovery after all. At the last minute, you might have found new documents with completely new evidence. You realize that the expert you thought wouldn't come is now going to be there. So now you have to rewrite your argument again. That's one scenario. Another scenario is that the opposing party will simply ignore the subpoena or dispute the subpoena. What the judge is supposed to do is enforce the subpoena, but often he or she just won't do that. The same goes for subpoenas sent to banks or other corporations--they'll ignore them or dispute them, and you won't be able to do anything to force them to comply because the judge will refuse to take action on your behalf. This is not all the aggravation you are likely to deal with. For instance, when you get all your witnesses to Court, most likely at considerable expense--most require several thousands of dollars to appear--the Judge will refuse to allow them to provide testimony. No, the Judge may not be so blatant as to say you can't put your witnesses on the stand! What the Judge might do is continue the trial to a later date so you would have to go through another round of requesting subpoenas to get them to come back. Plus, you would have to pay the witnesses additional witness fees. As for any documentary evidence you may wish to submit, unless you have memorized every detail of the Rules of Evidence, good luck getting them accepted by the Court as evidence! In my case, I had 90% of my exhibits denied admission as evidence. I hope you see how self-represented parties are completely screwed here. This is why I consider them so heroic because the odds against them are extraordinary. This is one observation I have in regard to the subpoena situation for self represented parties. The other observation I have is how hypocritical the CT Family Court system is to conduct business in this manner. NY TIMES ARTICLE IN 2006 CITES THE EXACT SAME PROBLEMS IN CT FAMILY COURT THAT WE HAVE IN 2018! "The mother from North Haven sat in the back of Judge Patricia L. Harleston's wood-paneled courtroom at the New Haven County Courthouse and cried quietly. She was unemployed, she owed more than $2,000 in child support and she had no idea how she was going to defend herself. She said she couldn't afford a lawyer, so she was representing herself at the child support hearing. Meanwhile, the lawyer for the father of her children sat across the room. "I don't know what my rights are," said the mother, who asked that her name not be used because of the sensitive nature of the hearing. "When someone else has an attorney, they know all the ins and outs and I don't." Same players, same victims, except in 2005 only 50% of litigants were self represented. In 2018, 89% of litigants are self represented. Note the reference to how the majority of self represented litigants are women! ELIZABETH A. RICHTER'S TESTIMONY IN OPPOSITION TO THE REAPPOINTMENT OF CHIEF JUSTICE CHASE T. ROGERS! PLEASE BE CHARITABLE! THIS IS THE FIRST VIDEO I HAVE EVER DONE! IN PART 3 RE SELF REPRESENTED PARTIES I MEAN GREEN LIGHT, NOT RED LIGHT--I KNOW YOU GOT THAT!!! ANOTHER CORRECTION, KARYN GIL DID NOT LOSE CUSTODY OF HER DAUGHTER, BUT SHE WAS HARASSED IN COURT FOR MANY YEARS WITH PAS USED AS THE EXCUSE EVEN THOUGH A PSYCHOLOGIST WAS CLEAR THIS WASN' A SITUATION WITH PAS. HOW KATHI SORRENTINO WAS JAILED FOR WRITING A CHECK OUT TO THE WRONG PERSON! On June 11, 2013, Kathi Sorrentino came to court with two separate checks--one made out to her ex-husband Saverino Sorrentino and the other made out to his attorney, Kevin Finch--each made out for $1,000. When the parties finally arrived before Judge Corinne Klatt, the judge stated "Last week the Court found the defendant in contempt and ordered her to pay a one thousand dollar fine today." Still, there was a possible way out of the fine. Judge Klatt had also told Kathi Sorrentino she could avoid paying the fine, if she obtained mental health treatment to stop her from filing so many motions. Like the vast majority of judges in Connecticut, instead of acknowledging the domestic violence that Sam Sorrentino had committed against Kathi, and for which there was ample evidence, Judge Klatt preferred to attribute all the problems in the case to Kathi Sorrentino's mental illness. All I can say is that Kathi can thank her lucky stars that Judge Corinne Klatt didn't call her "intelligent" the way so many judges describe other victims of domestic violence and stalking through the court system. Putting the joking aside, however, the fact is that using a mental health diagnosis or calling someone "crazy" for the purpose of discriminating against a family court litigant is a violation of the non-discrimination statutes of the State of Connecticut. Family Court Judges are not allowed to ascribe the refusal of an abused woman to accept the abuse to some sort of psychiatric problem, not only because it violates the Constitutional mandate against discrimination based upon disability, but also because it violates the Americans With Disabilities Act of 1990 and As Amended in 2008. Still, blithely unaware of these mandates against discrimination, and happily complaisant in her right to call a person who doesn't agree with her crazy, Judge Corinne Klatt stated as follows: [Filing many motions is a sign not of] mental illness but some sort of, some type of mental health issue...the repetitive nature of these filings indicates to me...that it was almost so compulsive that it might be indicative of some of mental health issue..."
Apparently, on June 4, 2013, Judge Klatt had stated that if Kathi Sorrentino could make a good faith showing that she had attempted to obtain some counseling for this so-called mental health issue, she would consider canceling the fine of $1,000 for the order of contempt. What Kathi did was see a person at her local domestic violence shelter. The counselor at the domestic violence shelter basically said that it looked as though the problem that was going on was that Kathi did not have an attorney. Immediately, Judge Klatt intervened and said, you can't say that; it's hearsay. But the DV shelter advocate was correct. Every self-represented party I know has had a problem with filing what the Court considers to be far too many motions. Of course, I know what the Court really wants is for all of us self-represented parties to do is shut up and go away. So even one motion from a self-represented party is much too much as far as a Judge is concerned. Still, I hardly think it is fair to single out Kathi Sorrentino for showing evidence of a problem that pretty much every self-represented party in the State of Connecticut has. I myself was fined $35,000 in attorneys fees for filing too many motions. So, I guess in comparison to me, Kathi Sorrentino should consider herself lucky. $1,000 is nothing in comparison to $35,000! However, since when does Judge Corinne Klatt think it is acceptable to define Kathi Sorrentino as mentally ill or intransigent based upon behavior that pretty much every self represented party is guilty of. Doesn't this all again add up to an unconstitutional attack on the right Citizens of Connecticut have to represent themselves at all. Isn't this a way to send the message, sure represent yourself, but as soon as you cross a single line, we are going to fine you into bankruptcy and call you nuts? The bottom line is that Judge Corinne Klatt did not consider the letter acceptable and proceeded to demand that Kathi Sorrentino pay the $1,000 contempt fine. At that point Judge Klatt demanded that Kathi pay the fine to the Clerk of the Court. Unfortunately, since Ms. Sorrentino did not have enough money herself to pay the fine, her daughter had written out both of the checks to different people--one to Sam Sorrentino and the other to his Attorney Kevin Finch and there were no other checks available to write out to the Court Clerk. Immediately, both Judge Corinne Klatt and Attorney Kevin Finch dumped blame on Kathi Sorrentino for not knowing who to write the checks out for. Attorney Finch: Again, this is just another effort of Mrs. Sorrentino to delay matters. Judge Corinne Klatt: I ordered her a week ago to come in with a payment of a thousand dollars. I gave you the week as a courtesy more than anything to you. I gave you a week in which to pay the fine, ma'am. And you come in today without a fine payment." Ok, well, Judge Klatt, not exactly. She had the fine payment, but it was written out to the wrong person. While Judge Klatt insisted that she had told Kathi Sorrentino who to write the check out to at the hearing on June 4, 2013, a review of the transcript for that date indicated that she had not. And, you see, here's the thing, how would anyone know that the fees on a motion for contempt would be payable to the clerk of the court. As Kathi Sorrentino stated, "Nobody told me who to make the checks out to and if you look in the records, nobody did." I have to say that I've been in and out of the Court for a decade and I sure didn't know that you would have to give the fine to the Clerk of the Court and not to opposing counsel. If its news to me, I'm not surprised its news to Kathi Sorrentino. These kinds of scenarios show up in court repeatedly where the Judge and the opposing attorney in an abusive case will set up a major problem that's simply invented, but a self represented party wouldn't know, and put on a big show of outrage and indignation just to demoralize the victim of legal stalking through the court system. This is why victims of long term stalking develop symptoms of PTSD and often lose their ability to function in daily life or hold down a job. And, of course, that's intentional as well. So what did Kathi Sorrentino do here, stuck in the middle of court without a proper check. What she said to Judge Klatt is give me a little time and I will go and get a proper check and be back by lunchtime. But that would be much too easy. Instead, Judge Corinne Klatt decided to put Kathi Sorrentino in jail because she hadn't written the check out to the right person. You know, I have a sneaky idea how the Court could have avoided putting Kathi Sorrentino in jail. She could have had Kathi hand over the check she had written out to Attorney Kevin Finch and then Attorney Finch could have written out a check to the Court Clerk! That could have been another approach to getting the fine paid. But that would have been much too easy, wouldn't it? The bottom line, though, is that if there is any concern that a self-represented party might end up incarcerated, isn't that party entitled to representation by a Court appointed attorney? So what happened to that law? Not important if you are too busy abusing someone? I know that many of you reading this blog will think that situations like this are the exception. Unfortunately, this isn't so. They are the rule. This is why we so desperately need to reform our family court system. As a final note, Kathi Sorrentino did send a complaint about this incident to the Judicial Review Council, but by the time she did so the year long statute of limitations had gone by. This is what happens frequently when judges abuse litigants; it ordinarily takes at least a year to recover from the shock before any one of them begins to think about filing a complaint and by then the opportunity is gone. As one of the reforms of our legal system, I think the deadline should be extended up to two years. FOR JUDGES, BULLYING SELF-REPRESENTED PARTIES IS A WAY OF LIFE: JUDGE CORINNE KLATT REPEATEDLY POUNDS KATHI SORRENTINO IN MAY 23, 2014 CUSTODY HEARING! In an earlier blog on the Kathi Sorrentino case, I had spoken of the book "Man's Search For Meaning" in which Viktor Frankl stated that of all the many sufferings he endured in the Nazi Concentration camps, the worst he had to bear were not the physical privations, but the verbal abuse he had to put up with on a daily basis. When asked, "Why was this so?" his answer was, "Because it was so unfair." The context in which Mr. Frankl's words make the most sense in our Family Courts is in regard to how Judges bully and badger self-represented parties during hearings. In ways that are very predictable, judges treat the represented party as if he can do no wrong, while judges consistently browbeat, harass, and pass judgment on the character of the self represented parties. This is one of the most unfair aspects of our corrupt Family Court system. This phenomenon represents an ongoing, hidden disgrace in terms of how the Court treats litigants in Family Courts throughout the State of Connecticut. In the hearing that took place on May 23, 2014, Kathi Sorrentino fell victim to the policy of abusing self-represented parties, and thus ended up losing custody of her son, Storm. In this blog, I am referring to Judge Corinne Klatt who conducted Kathi Sorrentino's trial, but the bottom line is the techniques judges use in abusing self represented parties are well known and clearly judges discuss and share approaches. So all of them stand guilty of the same abusive behavior, not just any single judge. The most common piece of nonsense Judges allow in hearings with self represented parties is to allow the opposing attorney to submit motions right when the hearing starts. This is a violation of the due process right to know what you are being accused of in advance of the proceedings. Thus, with Kathi Sorrentino, Dr. Eric Frazer submitted a status report that Kathi hadn't had the opportunity to see prior to the hearing. Second, in Kathi Sorrentino's case, the judge allowed the opposing attorney to switch around the order of the witnesses right in the middle of the hearing which gave him considerable advantage. As long as attorneys can manipulate the legal proceedings at will and a self-represented party has no recourse for that, it is unlikely that a self-represented party will ever have a fair hearing. Often, judges will mislead self-represented litigants about court procedures as a way to disrupt their legal defense. For instance, in my case the Judge told me that I did not have to object to decisions I disagreed with because the rules of the CT Practice Book had changed and objections were no longer necessary to preserve your right to appeal. In fact, this was totally untrue. Likewise, Judge Corinne Klatt told Kathi Sorrentino that you are not allowed to object to a question that the opposing attorney posed, when in fact, of course you can. Also, Judge Klatt told Kathi she was not allowed to object to an answer. Ok, so you might not be able to "object" to an answer, but you can certainly expose the weaknesses in an answer during later examination. At other times when Kathi Sorrentino was legitimately standing up to state her objections, Judge Klatt responded with, "Please, stop interrupting." and "Stop shouting out in the courtroom." So an attorney who objects is objecting, but a self represented party who objects is interrupting or shouting. This kind of judicial reframing of the actions of a self-represented party turns the application of a standard court procedure into a form of wrongdoing which could be punished by a contempt of court. How can you possibly argue on behalf of your position under such intimidating conditions? Kathi: Did I ever deny you any time during your parenting time? Judge Klatt: All right. All right. Judge Klatt: All right. All right. All right. Judge Klatt: He's answered the question. You're not to argue with the witness; understand me? Judge Klatt: Ask your next question. As I read through this transcript, I didn't see that Kathi had been arguing, but this is the point, that the Judge imposes an interpretation on a neutral situation and finds wrongdoing where there is none. Other behaviors like this include repeatedly going "Stop, stop, stop, stop" when Kathi Sorrentino was doing something minor like handing over an exhibit too quickly, or another variation, "Whoa, whoa, whoa, whoa!" when Kathi asked the other side to show proof in regard to a statement they made. Or when Kathi tried to elicit testimony from her ex-husband as to why he refused to continue with court ordered co-parenting therapy, "No. No. No. No. No." There are also situations where a judge doesn't think you are conducting your examination fast enough as a self-represented party and after each question barks out, "next question!, next question!, next question!" as Judge Klatt did with Kathi Sorrentino. Or consider this outburst from Judge Klatt when she didn't think Kathi was going fast enough in her examination "This is the last time, move on to the next question. I have ordered you five times. I've actually counted. Five times I've ordered you to move on from that subject. Next question or I will stop this cross examination." Judge Klatt: Just ask your next question. Judge Klatt: Please ask your next question. Judge Klatt: Are you finished with your questions? Kathi: No. No, I'm not. Judge Klatt: Please. Then go. Judge Klatt: ...quite frankly, ma'am, I'm about to shut you off. Kathi: I'm sorry. It's not deliberate. Soliciting or Providing Testimony Outside Judicial Role: Frequently, when judges see there are big holes in a case, they will simply find a way to get the testimony in that is necessary to throw it in the direction of the particular litigant they've decided will win. In my case, I recall the judge asking my ex's attorney questions about some retirement accounts in my ex's name thus cluing the attorney in on what arguments to use to get my ex excused from the penalties he should have endured for not reporting them on his financial agreement. In Kathi Sorrentino's case, the judge intervened extensively and simply elicited the testimony he wanted to get out of Mr. Sorrentino, rather that leaving it up to the attorneys to argue to argue their case. If you have the judge inserting evidence into the case of his own volition, and disregarding his role as neutral decision maker, how can you possibly believe that you have a fair trial. Judge Klatt: This is not let's ramble on because, really, that's all you're doing. Are you familiar with what a filibuster is? Ma'am, are you? Judge Klatt: You're not? Not at all? Kathi: English and Studio Art major. Judge Klatt: And you don't know what a filibuster is? Judge Klatt: That's where somebody keeps talking just to stretch things out without really getting to the point of the issues at hand and which is what I think you're doing to me here. There is something inherently wrong when a Judge of the superior court thinks it is acceptable to make fun of a self represented party for not knowing the meaning of a word. With women who are representing themselves, there inevitably comes a point where the Judge will comment on how intelligent you are. I personally know several women this has happened to. This occurs because in these cases of abuse, the Family Court racketeers particularly choose women who are intelligent because the misogynist court system, I believe, is immensely gleeful to have the opportunity to humiliate and demean intelligent women. Also, they are aware that bright women are very likely to fight long and hard for their children, so this means more money for everyone all around. Kathi: I'm confused, your honor. Judge Klatt: Ma'am, you know what, Ma'am? It is my obligation to assess the credibility of witnesses and I don't think you're in the least bit confused. You're a bright, intelligent woman that has thoroughly prepared for this hearing and I think you're deliberately presenting to the Court in a fashion that makes you--that you're attempting to tell the Court or imply to the Court that you're confused. I am not believing you in that regard." Kathi: What I'm sensing and I'm hearing is that--that this is about me being accused of [being] an alienator and not complying with Court orders and I'm doing what I can to show that I am. Judge Klatt: Well, I hesitate to accuse, ma'am. That's -- it's an affliction. It is not -- it is not a crime we're accusing you of. Right, it's a mental illness not a crime, as if that matters, because the outcome for Kathi will be the devastating loss of custody of her child. So is Judge Klatt trying to say that Kathi shouldn't worry about it? How irrational is that? The bottom line is that whenever Kathi Sorrentino succeeded in making powerful points in her defense, which was actually quite frequently, Judge Klatt would find a frivolous reason to strike that testimony from the record. In addition, if Kathi was pursuing a successful line of questioning that proved that she was innocent of wrongdoing, inevitably Judge Klatt would allow the opposing attorney to jump up and down with irrelevant objections and commentary, or else she herself would interject discouraging remarks and observations. While for the better part, Kathi was able to make her points nonetheless, I recall being completely sidelined by those kinds of distracting techniques in my day. Meanwhile, the represented party pretty much gets away with anything he wants. He can provide extensive hearsay testimony, make unsupported and outrageous statements without being required to provide the slightest bit of evidence. He can refuse to answer the questions or answer them with outright lies and get away with it. In other words, for the person who has an attorney to advocate on his behalf, hearings like this are a breeze. For instance, at one point while examining Mr. Sorrentino on the stand, Kathi Sorrentino was able to point out that he had no evidentiary basis for his accusations. Immediately, Judge Corinne Klatt rushed to his rescue stating, "Well, ma'am, to be quite frank, that -- those comments are stricken. You want to know why? Because I am the one who determines credibility, not you." What this adds up to is that Kathi Sorrentino's hearing on May 23, 2014 was simply for show, a casual bow to the legal requirement that the Court allow a citizen a hearing before depriving her of her constitutional right to parent. The outcome of this hearing was already predetermined. But yes, given the fact that legal techniques and procedures are geared to expose the truth, it does take the active intervention of the Judge to subvert the proceedings and conclude with an entirely unjust final judgment as happened in this case. Many of the self-represented parties who undergo this trial by outright wrongdoing by a judge talk about how exhausted they feel afterwards. They are exhausted by the direct personal attacks and exhausted by the constant perversion of the truth. It can feel as though you are an exhausted boxer staggering around the ring flailing back at punches that appear to come out from all sides. There is nothing fair or just about such proceedings. The fact that Connecticut Family Courts conduct such show trials is a disgrace. With the passage of last years Bill #494 and with the upcoming Bill #5505, there is hope that we can correct these kinds of abuses. "Despite the economic barriers to justice faced by struggling Connecticut families, rising from the ashes of the highly charged public debates over how to reform the family courts is a shockingly insensitive outcry from court industry insiders demonizing the 85 percent of divorcing parents who have chosen to invest in their families instead of attorneys. Tauck v. Tauck was perhaps the most inefficient and expensive trial in Connecticut family court history, spanning over five years, 600-plus filings, and ending in an 86-day trial in 2007 that played out before Judge Holly Abery-Wetstone on Middletown's Regional Family Trial Docket. According to the Hartford Courant, the family paid out some $13.3 million in fees to the dozens of legal industry professionals on the case, including $1.3 million paid (without challenge) to attorney Gaetano Ferro, the children's guardian ad litem. Clearly, the legal industry professionals were the big winners in the Tauck case, and if ever there was a case for cutting out the middleman and going pro se, it is the Tauck divorce. While some may be quick to blame the Nancy and Peter Tauck for their part in spurring on this "high-conflict" litigation marathon, one might also question the competence and propriety of the judges and legal professionals who had clearly lost control of the case. Did Judge Wetstone really need help deciding the case from dozens of industry professionals who just couldn't seem to agree with each other on much except that the $13.3 million they charged the family was "necessary and reasonable"? FROM THE CT LAW TRIBUNE: JUDICIAL BRANCH PRODUCES EDUCATIONAL VIDEOS! A basic understanding of legal terms and courtroom procedures can be daunting for anyone who tries to get a divorce without the help of a lawyer. To help smooth the process of self-represented divorce cases, the Connecticut Judicial Branch has gone into the movie business. No, family court judges are not trying to win an Academy Award with a remake of the classic family drama Kramer vs Kramer. Instead, court administrators are producing instructional videos to teach the masses how to resolve a divorce case. The hope is that the videos will help real-life litigants to more effectively navigate the system. The production costs are being covered in part by a $20,000 grant from State Justice Institute, a Washington, D.C., nonprofit corporation that awards grants with the intent of improving the quality of justice in state courts. Technical support, including help writing scripts for the videos, is being provided through a partnership between the Judicial Branch and the New Haven Legal Assistance Association. "Some people are visual learners, and some people have limited literacy skills, so we found the videos are a great way to demystify the court system and help people feel more comfortable using the courts," said Susan Nofi-Bendici, the executive director of the New Haven-based legal aid organization, who worked on the videos in an advisory capacity. "Look, a video is never going to be as good as lawyer," she said, "but if we can't meet the legal demand for providing legal services for everyone, at least we can give a lot of support to people by providing them with information on how to represent themselves." Since the Judicial Branch video program started in June, two of the instructional videos have been completed and put on its website, as well as on YouTube. The first to be uploaded in the news section of the Judicial Branch website is called "Your Uncontested Divorce." More recently, a seven-minute video, titled "How to File For Divorce," was added. With court clerk, secretaries and even a judge "acting" out the roles of court personnel and divorcing couples in front of the camera, both videos walk viewers through the steps to file for a divorce in Connecticut Superior Court. The videos show viewers the various forms that are filed in divorce cases. Key phrases that are used in court are clearly defined. In the first video, for example, the narrator, Jim Lawlor from the Waterbury Court Service Center, instructs viewers by using simple, everyday language. "Broken down irretrievably," Lawlor says. "This is the most common reason people give for wanting a divorce. It means there is no hope of the spouses getting back together." Krista Hess, who is the court service center programs manager for the Judicial Branch, said the idea for creating instructional videos has been tossed around for a few years. The idea for the videos was born out of the strategic plan created by the Self-represented Parties Committee. The committee was formed in 2008 to study the changing legal landscape and to look for ways to implement tools and resources to adapt to the growing number of self-represented parties in the courts. The idea was to increase the availability of information, to better help pro se litigants navigate the court system in an efficient and timely manner. Hess was on the committee. She said members agreed videos would be a good educational resource, to be used in addition to help center locations and law libraries that provide instructional materials at 13 of the state's 15 judicial districts. "Primarily, the idea is that since courts are only open from 9 to 5, and people have to go into the courts to get that information, that could be problematic for a lot of people," Hess said. "If we provide electronic access to the instructional materials, people can watch them when they get home from work, even if it's 11 o'clock at night." Many court employees appeared in the videos, including clerk's office staff, foreclosure mediators, court service center workers and marshals. "We're really trying to give people a very basic understanding of what they might expect in court," she said. "For example, when they go to the courthouse, they will have to go through a metal detector, and when they go to court, they will have to stand and raise their right hand and be sworn in'."